Rewards-based credit cards can add up to major perks for travelers, but they're not for everyone. If you like to travel but don’t have a travel rewards credit card, it might be a good time to get one and start earning points toward free flights and hotel stays. When used wisely, these rewards cards can stretch your travel budget, so you can visit more places, extend vacations or upgrade accommodations. Bill Hardekopf, CEO of LowCards.com, says the bonuses on all rewards, especially travel rewards cards, are very good right now, as credit card issuers compete for market share. “It's always a competitive business, but when people are spending, credit card issuers know that they have to work harder to get a share of your wallet — to have you reach for their credit card before the others you have. And that's why they try to sweeten the rewards,” Hardekopf told NBC News BETTER. The average American could earn $227 a year in bonus travel — after accounting for annual fees — by using one of these cards. The rewards could be significantly more — an average of $901 — during the first year. This higher figure includes a sign-up bonus (available on many cards right now) and removes the annual fee (which is often waived the first year). 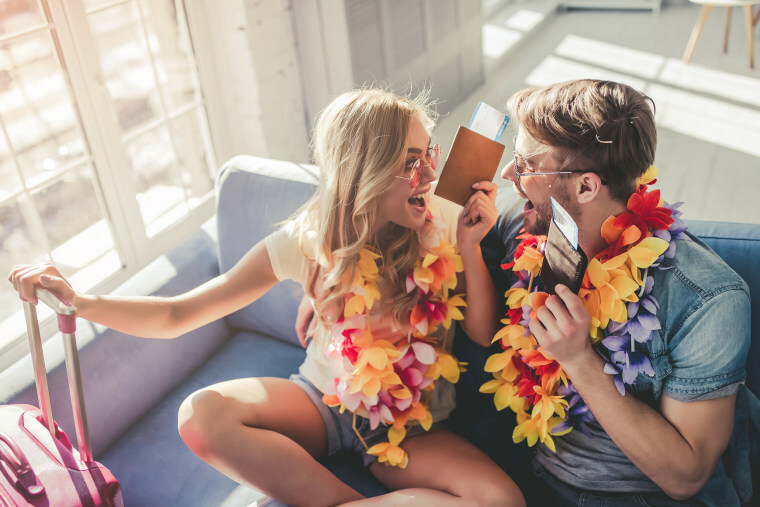 You can learn about the benefits and drawbacks of the cards examined in the NerdWallet study: Best Travel Rewards Credit Cards of 2018. You should apply for a rewards card at least five months before a planned trip, NerdWallet suggests. That gives you time to earn the sign-up bonus, points you can use to buy your plane ticket or free nights at your hotel. Rewards cards can encourage spending that leads to budget-busting behavior. About one-third of those with a travel rewards card (34 percent) say they often overspend to earn points for a trip, according to a NerdWallet nationwide survey. This was more common for millennials (50 percent) as compared with Gen Xers (37 percent) and baby boomers (19 percent). In fact, 10 percent of those who don’t have a travel rewards card say it’s because they’re concerned they would overspend just to earn more rewards. A valid concern, but for those who can fight the temptation and stick to their budget, “a travel rewards card will save them money over time, as rewards will reduce what they spend out of pocket for travel,” NerdWallet report noted. To qualify for a credit card with the most generous rewards — whether cash-back or travel — you’ll need good to excellent credit, typically a score of 700 or higher. Don’t even consider a rewards card unless you pay your credit card bill in full each month. “If you're carrying a balance on your credit card each month, any benefits you earn are quickly erased by what you're paying in interest and fees,” NerdWallet’s credit card expert Kimberly Palmer told NBC News BETTER. Do you pay on time? With some rewards cards, you’ll lose a month’s points if you miss a payment, Consumer Reports cautions in its Best Reward Card Buying Guide. To get those points back in your account, you might be charged a reinstatement fee of $25 or so. Most of the top-rated travel rewards cards have an annual fee, typically $95, that is waived for the first year. After that, these cards can cost you money, if you don’t make enough purchases to earn a decent amount of points. The Bank of America Travel Rewards card, a NerdWallet top pick, has no fee. At the other end of the spectrum: The American Express Platinum Card ($550 annual fee) and the Chase Sapphire Reserve ($450) are designed for road warriors. Much of their value is in the perks. For example, with the Platinum card you get an annual credit of $200 for airline fees and an Uber credit of up to $200, plus access to more than a thousand airport lounges worldwide. Both cards reimburse the application fee for TSA PreCheck ($85) and Global Entry ($100). Another option: If you tend to favor one airline or hotel chain, consider getting a credit card co-branded with that airline or hotel. Jill Gonzales, senior analyst at WalletHub, says these co-branded cards have some money-saving perks that are going to be “a lot more lucrative to you” than one of the general-use travel cards. The best airline and hotel rewards cards offer big sign-up bonuses and discount vouchers on the anniversary of opening the account. Airline cards typically have two important perks: priority boarding and free luggage check for the first bag — a savings of up to $200 per round trip for a family of four. Credit cards are not one-size fits all. Rewards cards are specifically targeted at various segments of the market. To find the one that’s right for you, you’ll need to compare reward structure, annual fee, interest rate, sign-up bonus and other perks. Here are some resources that can make the process easier.